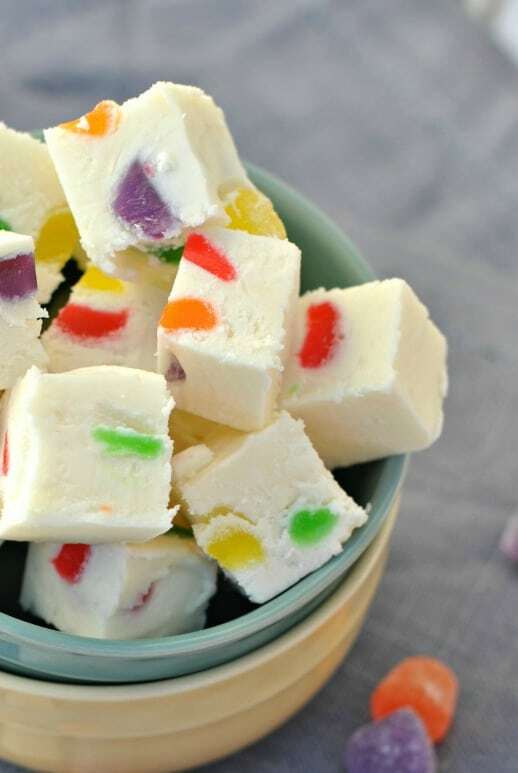 Gumdrop Fudge: Creamy Vanilla Fudge filled with colorful holiday Gumdrop candy pieces! So pretty for gift giving! I seem to purchase the same holiday candy year after year. Of course, I usually purchase the candy I love, which means I’m always so tempted to eat it. Sometimes, the candy I buy is one that only I enjoy, and nobody else seems to like it. Take gumdrops for instance. I love gumdrops. I’ve tried to convince my kids they are just sugar-coated jelly beans, but they refuse to touch the colorful candy. Which means every day, I grab a few here and there until they are devoured. Once again for the holidays, I’ve been lured into buying several bags of gumdrops, only this year I thought I would do something different. 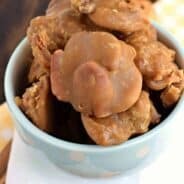 I saw a recipe for Gumdrop Fudge on Taste of Home several years ago and tucked it into my brain for future use. Using that recipe as inspiration, I added gumdrops to my favorite vanilla fudge recipe. I tell ya, knowing how to make fudge is useful when you have crazy ideas like this. At first I was a little concerned that chewy, fruity candy doesn’t belong in fudge. Fudge should be filled with chocolate, nuts, or dried fruit, like in my Chocolate Peanut Butter Fudge, Pistachio Fudge and Cherry Fudge with Dark Chocolate. But guess what? I was wrong. White chocolate fudge is the PERFECT base for your favorite fruity candy. Skittles, Mike and Ikes, throw them in! 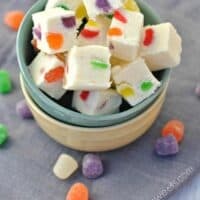 Or make some colorful fudge using gumdrops. 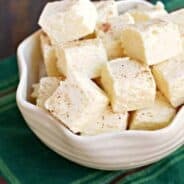 My favorite fudge recipe uses marshmallow fluff to make it super easy to make. You don’t even need a candy thermometer to make Gumdrop Fudge! Start by putting your white chocolate chips and marshmallow cream in the bowl of your stand mixer. You definitely want this ready to go before you start on the other steps. Make sure your gumdrops are also chopped and ready to go. In a saucepan, bring the butter, cream, sugar and salt to a boil and cook for 5 minutes. Remove this mixture from the heat and immediately pour it over the waiting white chocolate and marshmallow cream. Use the mixer to beat everything together until the white chocolate and the marshmallow cream are thoroughly melted and everything is combined. Then gently fold in the gumdrop pieces. I chose to make my Gumdrop Fudge with a whole rainbow of colors, but you could easily pick your colors based on what occasion you want to make Gumdrop Fudge for! Try red and green for Christmas, or your favorite colors for a birthday party. Once the Gumdrop Fudge has been poured into a pan and has set, you can cut it into pieces and package it up! Gumdrop Fudge would be a great gift to give to neighbors and friends. Fill a mason jar, add a lid, wrap some ribbon around it and give it away! Depending on the size of jar you use, you can make several jars of gifts from this recipe. Add some whole gumdrops as filler and more color too! ENJOY! 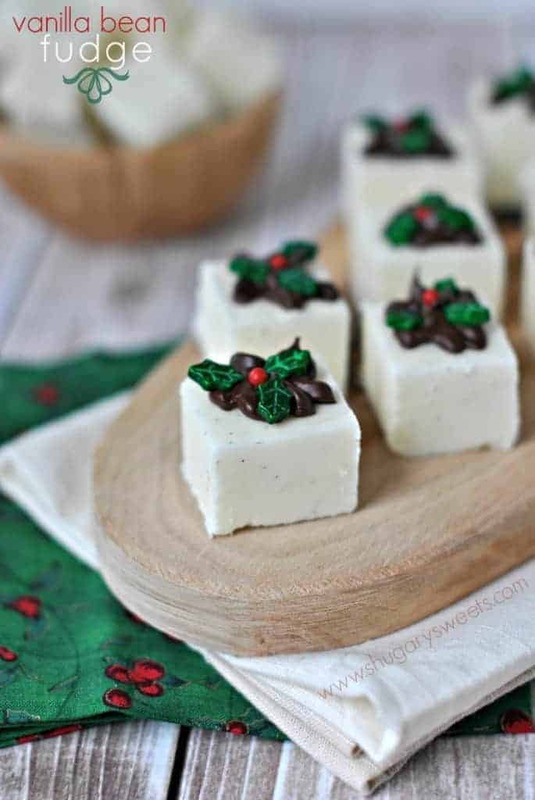 Vanilla Bean Fudge…another great holiday treat! 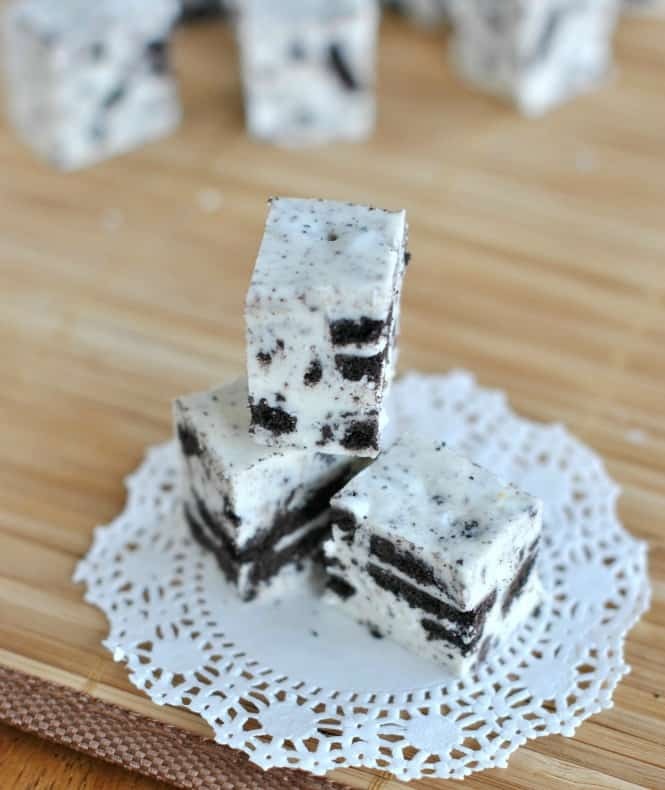 Cookies and Cream Fudge– my kids favorite! 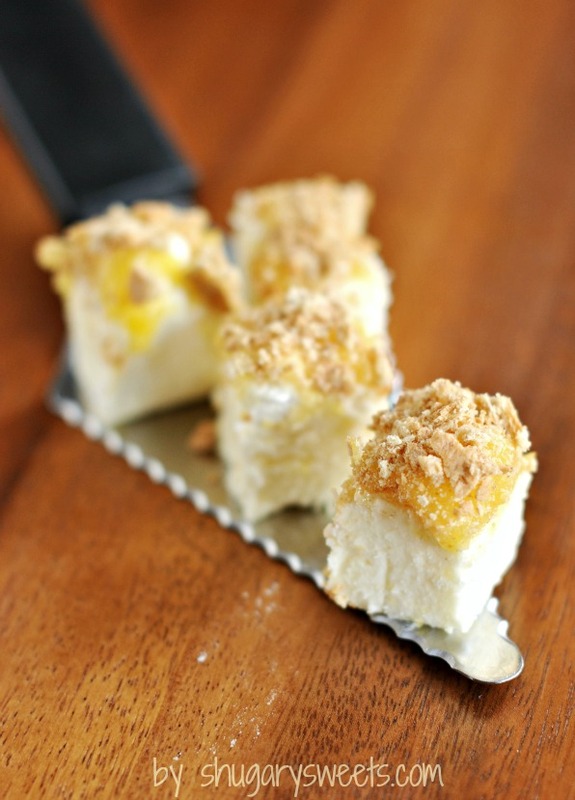 Lemon Meringue Fudge– gorgeous AND delicious! Don’t forget to follow my Fudge, Truffles and Candy Pinterest Board. Over 200 pins and counting! 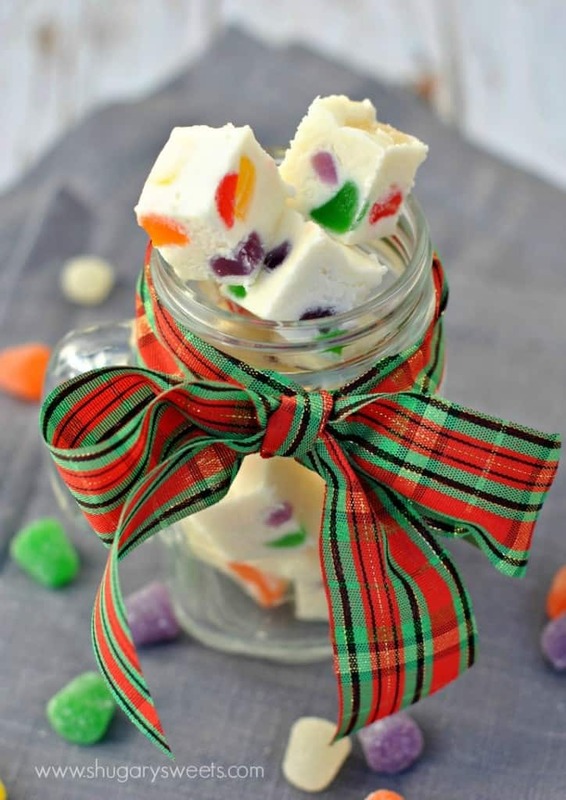 Creamy Vanilla Fudge filled with colorful holiday Gumdrop candy pieces! So pretty for gift giving! Prepare an 8inch square baking dish by lining it with parchment paper. Set aside. Add white chocolate morsels and marshmallow cream to a large mixing bowl. Set aside. In a large, heavy saucepan, add butter, cream, sugar and salt. Bring to a boil over medium high heat, stirring frequently. Once boiling, continue to boil for a full 5 minutes, stirring constantly. Remove from heat and pour over white chocolate and marshmallow cream. Using an electric mixer, blend for about one minute, until morsels are melted and mixture is smooth. Add gumdrops and fold them in with a spoon, gently. Pour mixture into prepared baking dish and refrigerate for two hours (or overnight), covered with a piece of plastic wrap. Every year when I was a kid we use to have a gum drop tree for Christmas. I can’t believe I forgot about that. Thanks Aimee for bringing back sweet memories to me! This is a great kind of fudge! I love how colorful this is. I have never been succusfull with making fudge 🙁 Hopefully this year will be different. I have a recipe for chocolate squares with marshmallows that would easily convert to this. My recipe is 1 can of sweetened condensed milk, 8 squares of dark chocolate and 3 cups or marshmallows. Melt the chocolate and combine the milk and then marshmallows. Sprinkle graham crumbs in the container you plan to use (mine is an old bacon keeper from tupperware, 10ish by 7ish) and sprinkle graham crumbs on the top… Anyways… this recipe could easily be done by using white chocolate and cut up gumdrops with the sweetened condensed milk. Just keep them chilled. Beautiful! They remind me of stained glass! I don’t like gum drops, but I absolutely love how colorful and pretty they are in the fudge! This makes me want to make homemade nougat with the jellies in it by brachs. 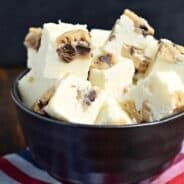 Yet another terrific fudge recipe! Love it. 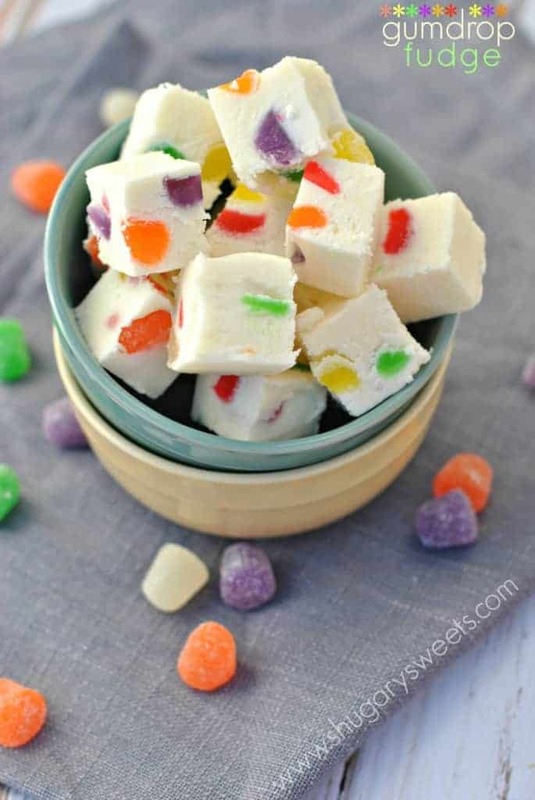 I have had gumdrop fudge and yes, they belong together for sure!!! My kids don’t like gumdrops either, but I happen to love them. Good and bad for me for sure! Oh MY GOODNESS this is the cutest fudge ever! Soooo pretty! This is so fun with all the different colors 🙂 thanks for sharing. Gumdrops are one of those things I think I don’t like…until I’ve eaten 50. I need to get a bag! There is something about gumdrops that make me nostalgic for childhood! These are gorgeous and very clever!!! Oh my gosh! The colors are so cute! I never would have thought to use gumdrops in a fudge. I know, whole new world of possibilities!! Oh my gosh, this reminds me of a candy that I ate growing up as a child, I can’t remember what they were called, but they were my favorite. I TOTALLY forgot about them until now. I need to make these! Love the idea of combining gumdrops and chocolate. Sugar + Sugar = yes. Was it those little Brach’s nougats with the chewy gumdrops inside???? Yumm!! I’ve almost given up on fudge. I just made this and it’s in the fridge. The recipe is so easy to follow even a fudge wrecker like myself can make it! Are chocolate morsels same as chocolate buttons or drops ? I made the fudge, tastes good. I put the parchment paper in the pan like it said, but the fudge just doesn’t want to come out in whole little squares when you cut it? Is it not set up right? It does seem a tad soft to me? Did you boil (rolling boil) the butter mixture for the full time? Sometimes if that hasn’t boiled completely it won’t set properly. I made this and All my gumdrops sank to the bottom. Is there a way to prevent this from happening in the future? Just made this with my grandson today! Looks yummy! It was easy. I used red and green gumdrops in it. I am excited to try this – and am planning to make it for gifts. I am afraid it won’t cut well… any tips for cutting it to make sure it looks pretty like in your pictures? Ohhh I love this recipe! So creative!! I love how festive the gum drops are in this fudge! It’s a great gift idea! Jsut made this and they are delicious. Did find them hard to cut. I’ll try setting them in a metel pan next time to see if they firm up better. I used a warm knife but the gumdrops stuck to it. Thanks for the recipe!